We recently had an interesting product sent to us by S4Gear: the LockDown Optics Deployment System. Don’t let the name put you off – this is just a really sophisticated harness strap. 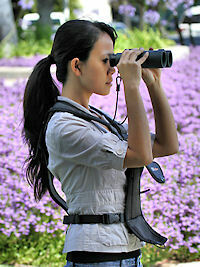 Most people who use binoculars already know about harness straps and many are using them. A traditional neck strap leaves all the weight of the binocular focused on the back of your neck, right on top of your spine. Even the lightest binoculars get heavy after enough hours in the field. A traditional neck strap also leaves the binocular loose on your chest, so just walking can cause the binocular to bounce up and down on your ribs, which gets old in a hurry! A harness re-distributes the weight of the optic between your shoulders and your middle back at the same time that it more closely secures it in front, limiting the scope of that chest-pounding action. So a harness increases your comfort in wearing a binocular. The S4Gear LockDown takes the harness concept a few steps further for even greater comfort and convenience. The strap is designed only for roof prism binoculars, so if you’re carrying a porro prism, you can pretty much stop reading now. The LockDown harness comes in two sizes for roof prisms between 4.5 and 6 inches long, and those from 6 to 7.5 inches in height. The device also substitutes for the rainguard and objective lens caps. The binocular housing section consists of a semi-rigid, foam-covered shelf that the binocular fits under, and a flexible flap beneath it that can be brought up and locked in place when storing the binocular or protecting it from the elements (see photo view). The binocular attaches by the strap attachment lugs to a pair of bungee-like cords; then you adjust the tension on those cords so that it fits snugly up under the shelf. The shelf acts like a rainguard, but it’s also maintains the tension of the system. To deploy the optic, grab the barrels and tug slightly down and then out away from you. It’s a little odd getting used to it, but once you are used to it, it’s excellent. The housing is attached to a broad, padded, Y-shaped strap where the arms of the Y encircle your neck and the single straight section goes right down your spine. Two elastic straps at the base of the straight section fit around the midriff and snap into place with double-toothed clasps to the base of the housing. 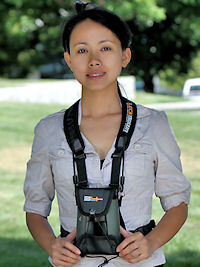 The midriff straps pull the binocular housing tight against your body, preventing it from banging on your chest. 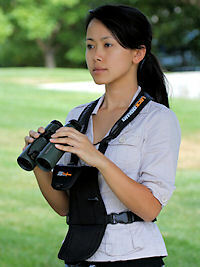 Additionally, by obviating the need for a rainguard and objective lens caps, this harness actually lightens your binocular ensemble. Those items can add several ounces to the total weight of the binocular. It may not sound like much, but the longer you are out on any given day, the more significant it becomes. The straps are available in a black and gray color scheme or with Realtree AP camouflage for $5 extra. The inner portion of the strap has kind of a waffle weave texture to it so it breathes a bit better. Clearly a lot of thought went into the design of this harness. 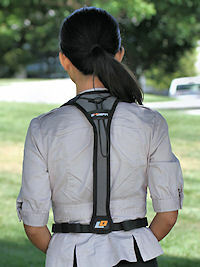 Several of us field-tested the LockDown harness extensively and found it comfortable and easy to use. You can set it with one of the belt straps permanently locked so you just slip the Y-section over your head, attach one clip and you’re ready to go. We’ve tried it with a variety of binoculars from a number of manufacturers, and we had no issues with fit once the tension in the straps and cords was properly adjusted. The device is fairly intuitive – it doesn’t take a genius to figure out how to attach the binocular to it or how to affix the straps. Because of its configuration, it’s impossible to twist any part of the harness, though you could tangle the belt section if you try. It’s even pretty comfortable when you’re riding in a car. We found that the multiple advantages of this harness design make it well worth the little bit of extra cost relative to traditional harness straps. Which brings us to the price: the S4Gear LockDown harness sells for $39.99. Overall, the S4Gear LockDown is simply a great product and we highly recommend it to anyone who owns a roof prism binocular. The S4Gear LockDown Harnessses were discontinued in January 2018. Since then, Nikon has made some major improvements and in January 2019, introduced their Trex system with the Nikon Trex EXO Carry System, $69.95, as the closest alternative harness. We will be reviewing the Nikon system in the future.